When you redeem at SouthSmoke.com, you convert your Smoke Points into SouthSmoke.com Gift Cards which may be used on future online orders. You can even redeem your Smoke Points for other merchandise and even travel awards. 1 You can go shopping without spending a dime on your next online Hookah supplies order. Just make sure to redeem your Smoke Points with your order. 2 SouthSmoke.com gives you lots of options when redeeming your Smoke Points. 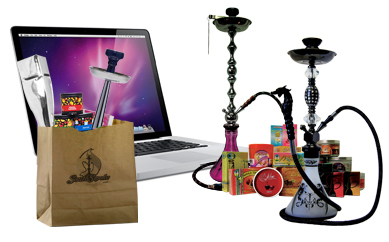 Choose from Hookah supplies to retail merchandise and even travel awards. 3 There are a variety of different redemption options available for SouthSmoke.com customers, including electronics, jewelry, hookah supplies, travel awards, and much more. + Check your Smoke Points balance and visit the SouthSmoke.com Smoke Points Rewards Mall to see what items are eligible for redemption. You may choose to redeem with as few as 90 Smoke Points. + You can either redeem your Smoke Points for gift cards which may be used towards future orders at SouthSmoke.com or you may use your smoke points for other retail merchandise. Click Here to view the different items that are eligible for redemption. + Once you have selected the item you would like to redeem, add it to your online shopping cart. You will be able to see the item you have selected for redemption in your online shopping cart. At this time, you may proceed to checkout. + When your transaction is complete, your SouthSmoke.com gift card will be sent via email which may be used to discount your next online purchase at SouthSmoke.com. If you selected retail merchandise as part of your online redemption, just make sure to look out for your order in the mail. It's that simple! Click Here and login to your online account at SouthSmoke.com. Check your Smoke Points balance and Click Here to visit the Smoke Points Rewards Mall to see what items are eligible for redemption. Add the item(s) that you would like to redeem to your shopping cart. Click on the "Redeem" button next to the product and then proceed to checkout.